This is a lovely canapé or alternatively can be used instead of traditional stuffing. I love the burst of flavour as the cranberries pop in your mouth! In a small pan, over low heat melt the butter with the onion. Cook until softened but not caramelised. Remove from the heat and add the breadcrumbs and stir to combine. Leave the mixture aside 10 minutes to cool. In a separate bowl combine the sausagemeat, apple, cranberries, pecan nuts, sage, parsley and spice. Mix well to combine, then roll into balls. 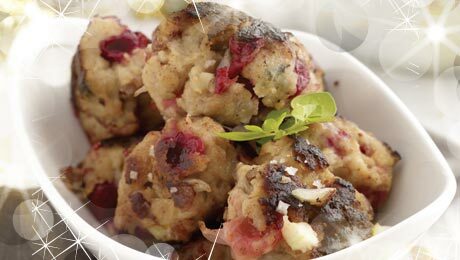 To cook transfer the stuffing balls to a roasting tin and place in a preheated oven for 40 minutes, turn occasionally through the cooking process to ensure even cooking and a lovely caramelised finish.